Pension / Family Pension of all existing Defence Civilian Pensioners, who retired/ died before 01.01.2016, will be revised notionally by fixing their pay in the pay matrix recommended by the 7th CPC in the ‘Level’ corresponding to the pay in the ‘Pay Scale/ Pay Band’ and ‘Grade Pay’ at which they retired/died. Sub: Implementation of Govt. decision on the recommendations of the Seventh Central Pay Commission-Revision of Pension of Pre-2016 Pensioners / Family Pensioners etc. Ref: This office important circular no. C-153, bearing no. G1/C/0199/Vol-1/Tech, dated 12th August 2016. 2. Now, Govt. Of India, Ministry of P, PG and pension, Deptt. 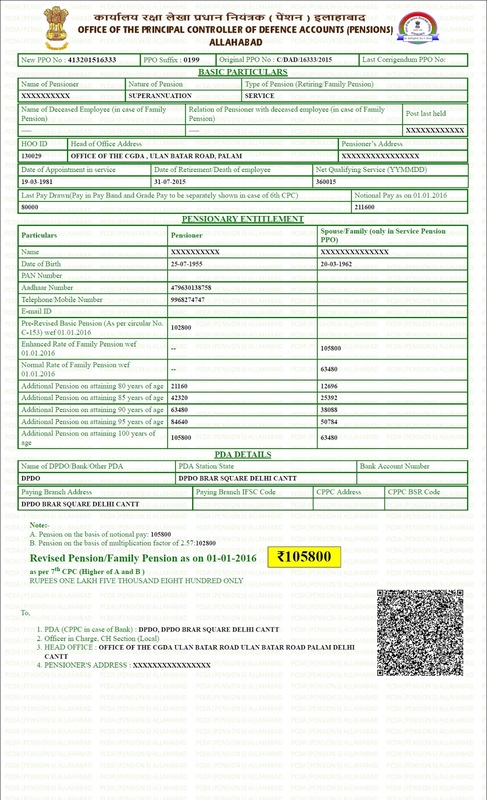 of P&PW has issued further orders vide their OM No. 38/37/2016-P&PW (A), dated 12.05.2017, according to which pension / family pension of all existing defence civilian pensioners, who retired/ died before 01.01.2016, will be revised notionally by fixing their pay in the pay matrix recommended by the 7th CPC in the ‘Level’ corresponding to the pay in the ‘Pay Scale/ Pay Band’ and ‘Grade Pay’ at which they retired/died. This is required to be done by notional pay fixation under each intervening pay commission based on the formula for revision of pay. In this regard,DoPPW,vide,OM No. 38/37/2016-P&PW(A) dt.06.07.2017 has issued concordance table wherein pension of retirees in various pay scales existing over different periods has been indicated. 3. In terms of these orders, the higher of the two formulation i.e. pension/family pension already revised by the PDAs in terms of this office circular No. C-153. dt. 12.08.2016 (i.e. 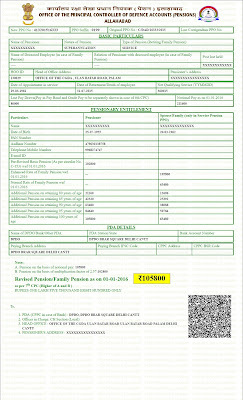 after multiplication by factor of 2.57) or the pension/ family pension as worked out in Para-2 above shall be paid w.e.f. 01.01.2016 to all pre-2006 Defence Civilian Pensioners/ Family Pensioners. Also, Corrigendum PPO, showing revised rate of Basic Pension/Family Pension to be paid w.e.f. 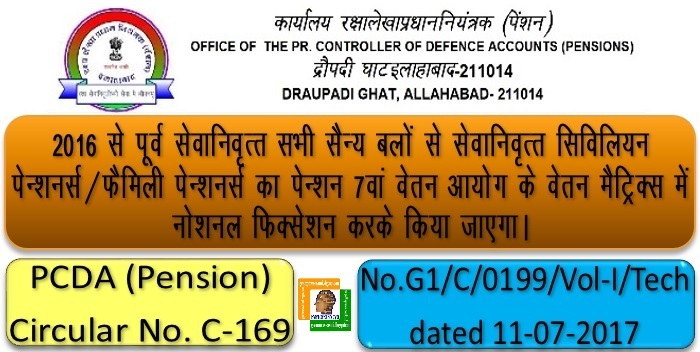 01.01.2016 to all pre-2006 Defence Civilian Pensioners / Family Pensioners, will be issued by this office. 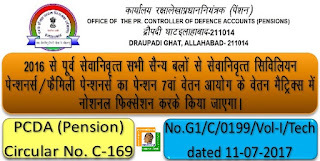 Form of intimation by the Pension Disbursing Authority to the P.C.D.A. (P) regarding revision of Pension in terms of Department of Pension and Pensioners Welfare Office Memorandum No. 38/37/2016-P&PW (A) dated 12.05.2017.